On the contrary, Trump has gone out of his way to praise Mattis, singling him outduring his State of the Union speech in January for “doing a great job.” Trump has acknowledged that he likes generals—so much so that he named three of them to his inner circle after becoming president: Mattis, McMaster, and Kelly, who was initially the Homeland Security secretary before moving to his White House job. 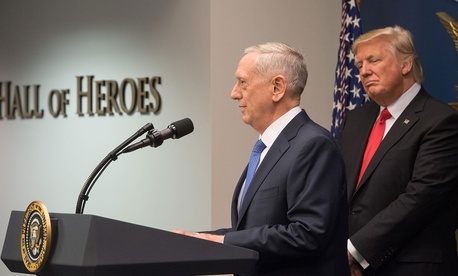 But the military rank is not the only reason why Trump’s relationship with Mattis hasn’t deteriorated as it has with the other generals—and indeed much of the rest of his Cabinet. Tillerson’s departure will also raise the profile of Nikki Haley, the U.S. ambassador the UN, who at one time was mentioned as a possible replacement for the outgoing secretary of state. Mattis has previously praised her. His relationship with McMaster is reportedly tense, though The New York Timesreported Tuesday that the national-security adviser may also be own his way out—to be replaced by John Bolton, the Bush-era ambassador to the UN who is hawkish on Iran. Mattis might not get along with McMaster, but it’s unclear if he takes Bolton seriously.